spent the day with us ......we have laughed all day. A five year old laughs pure, his eyes sparkle and his laughter is infectious. We laughed at cartoons......we laughed while blowing bubbles......we laughed because we found a cool, grassy puddle just waiting for us to splash through.....we laughed as we made blueberry smoothies and while cooking lunch. We laughed as we made up games to play with building blocks and play dough........I am exhausted from laughter. My wish for you all tonight, that at some point this week, your day is not wasted and you are exhausted from laughter. When I read this quote this morning, I was struck by its truth. These words describe many of the students that I have taught through the years, these words describe me at some places in my life, they probably describe most of us at some point or another. One of my students had a lengthy conversation with me before class today, about the present, about living in the now. He said for the first time in many years, he could sit on the porch and rock.......and be happy, just rocking. This young man has reached a turning point in his life.....he's ready for a new path. This coming Sunday, if it rained all afternoon.........would you wish away the rain.......or you would enjoy it? Sometimes life becomes so difficult, so hard, so painful........we think the worst, we question the value of living, sometimes we act on those thoughts. I talked with a student today, who had been in that darkest of places. The light of love has to shine extra bright to those in the dark, who think the world would be better off with out them. can save and/or guide someone else out of the darkness. Each of us is so unique, our life experience so valuable, we can't willingly end the life of who we are......we have to understand, a life of service......how important that we give, that we serve, that we are there to lead those who come behind us. Depression and the desire to end one's life........that is the darkest of the nights, the most painful of pains......it is the cry that is often heard too late.......it doesn't have to be that way. Love is the light, feeling/being needed fuels the light to shine even brighter and a helping hand has to be given. I reminded my student today, that his life, his experiences, his love.....was needed by so many. His life could help so many others......he knows, and he is working toward leaving the darkness.......it will not be an easy road.....in some ways leaving the darkness will be harder than entering the light, after all the darkness offers a false sense of comfort. But, he is brave and strong and the will to live, the will to love is starting to surface. I think there are many that struggle so desperately with that darkness......maybe they think they have no options, no hope, no light. It is complicated, and a slippery path, but it is possible......with help, and with love......the light is always there......the eyes and the heart have to open......a helping hand given. straighten book shelves or closets, five minutes......What can I tell you? for me, it works....it is amazing how giving something your un-divided attention for five minutes works. Things are more organized, I can see my to do list growing shorter and I am much less stressed. I look at it, spend five minutes and before I know it, many times by the end of the day......everything is done. To be honest, often just getting started on something for me is the hardest part, especially if I know it is a lengthy task......but starting it with the intent of only spending five minutes, well many times I end up spending the amount of time I knew it would take because I spent the first five minutes getting started and before I knew it, the task is complete. I know that sometimes, even five minutes is difficult to find but try it.......five minutes might just work for you. Five minutes, set the timer. Saturday night in a small town, there is nothing like it........tonight we did a benefit for Backyard Blessings. A local organization that helps to feed our local school children on weekends during the school year. We live in a poverty stricken area, this organization sent over 13,000 bags of food home with children this . past school year. Children who get lunches when they are at school, but very little when they are home on the weekends. It's hard to believe isn't it that so many in America have so little. We have helped with this fundraiser since it started three years ago. Tonight, we ate hot dogs, drank lemonade, listened to local groups perform, watched tons of kids play on jump jumps and heard laughter ring throughout the local park. I can promise you, many who were there have little, but everyone gives what they can........and everyone there had a good time. doing all that they can to help each other out.......what a great night. Salmon Fishing in Yemen........the title intrigued me, the story line reeled me in (no pun intended) It is a beautiful movie that Rick and I watched tonight. I am all about a good story (special effects are not the first things I look for in entertainment) It is a movie about faith on its most basic level, belief that possibilities are there, that the impossible can sometimes be achieved if only for a little while. It is an English movie and I admit I am a sucker for European films. And, Emily Blunt is one of my favorite actresses. It has been a good day, slowly the downside of treatment has retreated today.....not yet a 100% but getting there. A couple of my Monday night students gave me a gift certificate for a massage, I used it this morning. I felt sorry for the masseuse, she kept exclaiming about the number of knots in my back and shoulders, it was deep tissue massage so she earned her pay........she probably needed a break after me. what I teach.......you can't help others, if you don't help yourself, you can't care for others, if you don't take care of yourself. I took care of myself today. Sometime this weekend........put your oxygen mask on.......take care of yourself. Sunflowers are such happy flowers, the colors, the way they lift their faces.....always to the sun. These are from our garden, they are six feet tall and the bees are loving them! The whole house felt different after I brought these in today. 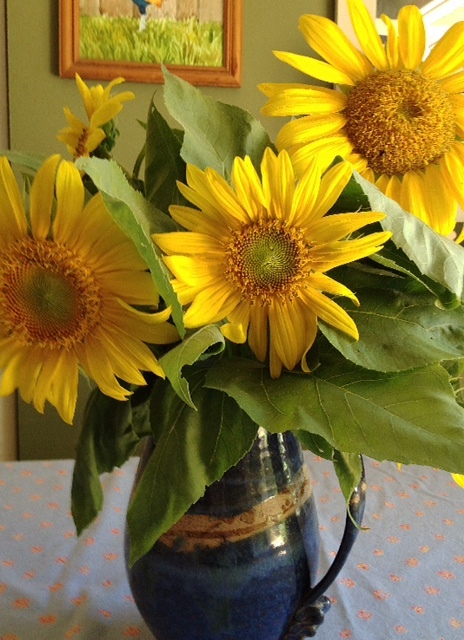 Even though my knees were wobbly and shaky, I felt better looking at my blue pitcher filled with sunflowers. I hope these beauties brighten your evening. Treatment #18.......my, my how time flies.......a very long day.....doc, lab, treatment. Spending the day with chair buddies, sharing time in those big green chairs, comparing drip time.....watching the nurses orchestrate the sticks, the drips and everything in between. Good news, my numbers are up. Achy, and head hurts, weak and shaky......my bed will feel so good tonight. We laughed a lot today, there was a joyful noise in the fusion room and this afternoon the sun actually shone through the windows. Interesting information today.....a black box warning has been issued for the clear life sustaining gel I get every month. Honestly, it seems most medicines have that warning on them now. Yin and yang even in medicine. tirelessly.......no matter where this path takes me, I am grateful......and I know oh so well, it could always be worse. the creek and pond down below the barn are about to expand......his universe is growing. Most of my students deal with chronic pain and with all the wet weather, they have suffered......classes today were devoted to pain management.......breath work as well as movement. Many of them have not slept well this week......most of them fell asleep during relaxation today.......I did hear some snoring. I don't mind, their bodies and spirits needed it. The weather is one thing that reminds us of our connection to the universe.......a change in the weather can intensify our pain, stiffness, and depression and trigger a migraine. Cloudy days, rain, hot sunny, cold.....weather truly affects our moods and our bodies. Normally rain doesn't bother me, but this abnormally wet cool summer has brought on some aches and pains and a tinge of sadness at times. I have reminded myself, that weather changes, just as life does.......in a few months, we could be in drought.....or snow and freezing cold......or a very warm winter. It is that same circle of change.......good and bad.......sunny and warm.....cold and rainy.......happy and sad........blue skies or storms. Life and weather......always changing.....not always to our liking.......but always changing. Some days this quote becomes my mantra, some days this quote is my goal for the day........I might be wrong, but I think Ms. Angelou nailed it with this one. Actually I hope we all laugh way more than we cry. Two more songs down, a few more to go......this cd is like birthing a child(what do I know, I've never had one, but I have heard stories) Our goal, cd to be ready by the end of August....wow......a LOT of work to be done......songs done over and over, lines over and over.....what sounds good one day, the next day sounds scary. How do you make this happen? We don't have the luxury of going in like rock stars, spending two weeks, day and night and coming out with a finished product.......bits and pieces here and there.....some tears, a lot of sweat......and laughter. Playing two hour gigs helps.....you build skill, voices, stamina......it polishes the rough spots....and soon you learn what works and what doesn't. Now,we have to think about cover art, photos......it is an interesting process. After all that cover will be around for a long time (hopefully) and so will the cd (hopefully) it is a work of love a long time coming. Age and illness push you......to do the things you always wanted to do, to accomplish or at least try to, some of your dreams. One of things the practice of yoga has taught me......things happen when they should......what can I say, life has taught me that......it happens when it happens, not necessarily when you want it to......and sometimes it doesn't happen at all......but at least you try. I can promise you this..... when the cd is done.....it will be announced......probably more times than anyone cares about......but there will be a celebration.....and a cd release concert somewhere, sometime. a week of all good things. We said our goodbyes to our nephew Michael today........it was difficult to say the least. We played our gig at Hart and Soul tonight, and several friends who had never been to hear us came.......it was easy and fun. Life continues in that cycle of yin and yang, up and down, sad and happy......."the world keeps spinning", a line from one of our songs and it does "keeps spinning." I am physically and emotionally empty tonight.......but that is ok. I know that this too shall pass. Thanks to all of you who said prayers and sent love. Tonight after dinner, Rick and I were sitting around, chilling out.......we had been to my sister-in-law's brother's funeral today, knowing that tomorrow we would be at our nephew's service and then play a gig tomorrow night......it all just seemed too much to comprehend. The phone rang, which it seems it has rang constantly the past few days, but this was one of my most loved friends......when I said hello, she told me to open my front door and walk out on the porch.......I did. jumped out and hugged me. Can I say how much this surprise visit made my day? It made my week. They came in, full of giggles and love.......they didn't stay long, not nearly long enough......but they let me know how much they loved me. The house was a wreck and it didn't matter, what did matter.......they came to see me, to let me know that they loved me and my family, that they were there for us. Truly, I don't think they will ever know the joy their short visit brought to Rick and I tonight. What I can tell you all tonight is this.......if you ever feel you should pick up the phone to call a friend or loved one, do it.......if you feel the need to visit a friend, just as Brenda and Becky did tonight.......do it......write a note, send an e-mail or a card . After their visit tonight.......I am ready for tomorrow.......I know I am loved....what a wonderful gift. Grief ....keen mental suffering over loss. Practically everyone I know has experienced grief or loss.......we all suffer because of it, and we all deal with it in so many different ways. Some of us, after the initial shock, push it deep down inside hoping that it will somehow disappear......others never get past that first deep wave of sorrow and drown helplessly for the rest of their lives in pain. Some cope, making it step by step but often losing their way in the anger and bitterness of loss. Many of us wonder if the hole in our hearts will ever heal, is there some super glue that can fix us? My family has reeled with grief this week, first my sister-in-law's brother died and then the death of my nephew yesterday........but we are not alone. As I sat and talked with my students today about my grief, two of them had buried close friends this past week.......it seems grief touched many of us this week......so many more that we don't even know about. I know this about grief.......it changes you......some for the better, some for worse.......I think most are just changed by profound loss. Each experience is unique, because each loss and its value to our life is unique. Grief leaves scars......big open gaping wounds slashed across our hearts that remind us daily of our loss. and there is no replacing those who die. Time, for me.......has softened the pain most days.......but there are moments ( and who knows what triggers them) when the grief for someone that I have loved and lost sweeps over me and I am once again floundering in that pain, as fresh as the day it appeared. Thankfully, those moments get farther apart with the passing years. and good thoughts do too. Thank you all for your good thoughts and prayers for my family. Please send love and prayers to Pat and her daughters, Becky and Jayna, and to Michael's three children. This is a bleeding heart that belonged to my grandmother Mamie....it's probably close to 40 years old, she gave it to my mom, my mom gave it to me.......I have become my family's keeper of the plants.....that has become my legacy. 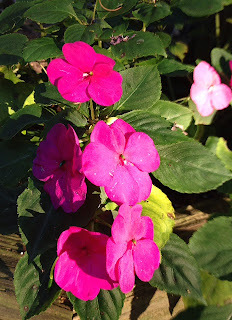 I look at this plant and think of the women before me who cared for it, they cared for me also. The leaves are deep and fairly thick, the small white heart shaped blossoms bleed with red drops.......each winter it becomes a gnarling tangle of barren brown vines......and with spring, life explodes in its mass of leaves and flowers. they blossom. Plants flourish with love and kindness, just as people do.......it's nothing complicated, I said it so many times before.........we all need,.......a place to live, food, water, and love. To flourish and thrive is so simple.......we make it so difficult......adding the things we want, not always what we need. 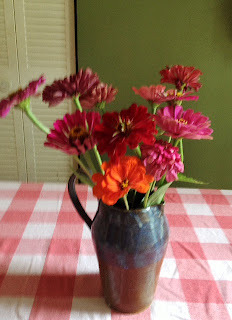 Zinnias straight from my garden, in a pitcher that our nephew David made, on my grandmother Mamie's tablecloth. I love "old maids" (where did that come from), they are such happy flowers. My plants are almost waist high, soon the sunflowers will be blooming. One of my dreams as a child........a flower garden full of flowers, so that I could pick as many bouquets as I wanted. My grandmother Mamie's yard was full of flowers, she always let me pick as many as I could carry home.......I do the same with our nieces and nephews. Fresh flowers in the house just feel right........nothing says welcome like flowers......on the table, in the bathrooms, in the bedrooms, on the porch. In the winter I have actually cut pine and cedar branches and placed them in vases around the house . I also cut fresh herbs and mix with the flowers in the spring and summer. Thanks for letting me share my bouquet with you tonight. Wish I could send you an arm full of flowers. I don't enjoy someone else's troubles, it does not make me feel good to see another human suffer, to see someone make a bad choice. I love to see others succeed. I know, I should have been a cheerleader......( I wasn't cute enough). I suppose now, I am somewhat of a life coach maybe?.......I just know it does my heart good to see friends, family and even those I don't know succeed. I figure if those around us are doing good, the good will spread to all of us. There's plenty to go around, enough for all. Hoarding never gives you more, it just makes you more afraid. I hope that this week brings good transformation for all of us, that the stars align, the gods smile and the angels sing........wishing you blessings of abundance, days of joy, nights of peace. A different kind of Saturday night........instead of us playing music, we got to hear some of our friends play tonight. I admit, it's very different not to be on stage, but it is always great to hear what others are doing. It was a wonderful night for an outdoor venue.......quarter moon shinning bright, and a gentle breeze blowing in from the east. Nice to be out front every once in awhile. Tomorrow our musical think tank group meets, I always look forward to our meetings......and next weekend we have a gig......but breaks are nice, you appreciate the down time as well as the up. That applies to anything you do.......the safest way to prevent burn-out.......take a break every now and then. It has been a busy Saturday, Calliou is already sleeping soundly.....time for me to join him. The monsoons have backed off for a few days......we actually had blue skies and sunshine today. we really are the same, we need a balance of fresh air, sunshine, food, rest, exercise, time with friends and family. Balance is the key to everything in life. These treatments I'm receiving each month have taught me valuable lessons about balance. I understand, truly understand what happens to the body when it is pushed past its limits. I get what rest is about now, and why the body needs it ( I knew before, I just didn't think it applied to me) ha,ha. Today, I lived in balance......spent time outdoors, walked, ate good food, did something just for me(got a new hair do) spent time with Jordan (he's five, he makes everything fun) and rested. I will be the first to admit that I don't stay in balance, but I try harder these days. Without your health, it doesn't matter what you have, who you are, where you live........health makes life worth living. So, even though I go down the slippery slide occasionally, I spend a great deal of my energy holding on to my health. I know what life is like without it......and how wonderful it is with it.......balance, yin and yang......what we need to thrive....and live. For those of you who have taken my yoga classes, you have heard my story about the lotus and my thoughts on it........for those of you who have never taken one of my classes here is the lotus story. The lotus flower grows in mud, in murky dark dirty water......yet the flower is so beautiful it is breath-taking and its oils are used in expensive perfumes. My take.......I believe we are all like the lotus....we have this beautiful flower in our hearts, this incredible love......and no matter how dark, how muddy our pasts are......that lotus is waiting to bloom. The lotus represents love, and a life that walks the path of light, coming out of the mud.....thus, "no mud, no lotus." Wednesday......my day off......much needed, energy has not been up to par this week. and yes, I did my gratitude challenge today! Gratitude........and joy.......today's class.....As we moved through each posture and did our breath work, I asked the students to think of one thing they were grateful for. Each pose became a gratitude pose, each breath, connected to gratitude. So my friends here is a gratitude challenge for all of you......At breakfast tomorrow, think of something to be grateful for, same thing at lunch, at break, at dinner, taking a shower, walking, etc.........in each activity that you do tomorrow, try to think of one thing to be grateful for.You don't have to share it or write it down, just think of it......and oh yes, don't forget to breathe. A day for love and kindness......class was meditation and asanas to remind our bodies that they deserve kindness and love. It's Monday, it is still raining, our ninth day with temps below 90 ( our average is 91 for this time of year) I think everyone feels waterlogged, mildewed and covered with mold. Days like today, you have to remind yourself about self-love......you have to be kind. There are mushrooms everywhere. But, to be honest......Alabama is the most lush and beautiful and green that I have seen her in years. As we sat and drank coffee on the screen porch this morning, I looked at the hemlock, and pines and the brilliant hues of moss on the ground and thought......"right now, we could be living in Seattle." It is breath-taking. Flowers, trees, everything is growing in spurts every day. Mother Nature is being extremely kind with her beauty right now. If your Monday has been a typical "Monday"........be kind to yourself tonight........a glass of wine, a cup of hot tea, a warm bath, listen to some great music, eat a piece of rich dark chocolate........Tuesday is just around the corner and Wednesday is right behind. Seeing friends, hearing from friends.......this has been my lucky day. Seeing someone or hearing from someone you have been thinking about is like pennies from heaven..........small gifts, meant to make you smile. reasons, don't see each other that often. Today, calls, texts and physical visits all came into play......and life is good. I read an interesting theory a few years back......basically that when you think of your friends, they too, are thinking of you. Wouldn't that be great if it were true........not really communicating, but just thoughts of each other at the same time. This has been a weekend of rest, a time to work in the flowers, do some laundry and just hang. I know for many it was vacation and travel time......I 65, the route to the beach was jammed yesterday and today. If I had been out of town, those pennies from heaven would not have come my way........so glad we stayed home. Here's wishing you all a week filled with pennies from heaven, may all your banks be filled. you allow it to get inside you." All I could find about it, was unknown quote. It is too bad that the person who said these wonderful words is not receiving credit for them. I just thought it should be repeated. It is so easy to let the negativity drown us, to let the waves overpower us. Don't breathe it, don't swallow it.......don't believe it. If you look, there is always something positive. Classes on compassion and healing today..........being in an addiction center away from your friends and family on a holiday is tough.......my students were glad to see me today. Everyone thinks because they can love others, that they have compassion........but, you also have to have compassion for yourself. How many can look in the mirror and honestly say, you love yourself. Body and spirit cannot heal without compassion. As classes ended today, students stood a little straighter, spoke more kindly and smiled. Many of them don't realize the safety net they have there at the center.......sometimes reality hits hard when they go home. That's why it is so important they understand compassion and the part it plays in their lives. Compassion for yourself, makes it very difficult to destroy your body and spirit with substance abuse. Compassion for yourself, enables you to feel more compassion for others and helps you to understand how your decisions touch everyone in your life in some way. It was an emotional day, I am drained.......but I felt the love in that small room today, I felt the compassion. The monsoons continue, I am glad we live in the foothills and not the valleys. I have thought of friends today and of holidays past.......huge celebrations, intimate gatherings, everywhere from Colorado to the Panhandle of Florida.......from snowflakes to sweltering 100 degrees. are the threads that hold the tapestries of our lives together......the glitter and sparkle of good times, family and friends. I am grateful tonight for so many things.....to live here in this country (even with all its flaws) for friends and family and the love they have given me, for the opportunities to celebrate......and for fireworks in the rain. Tropical rains are training........it feels like September......rain and winds, strange July weather. Tomorrow is July 4th, Independence Day. We have family coming by, I will cook entirely too much food......and eat entirely too much. The neighbors are shooting fireworks in the rain. Calliou the collie, is not happy. The first 4th of July Celebration I can remember.......I was maybe five years old. My dad had built a BBQ pit and picnic table in our backyard. My grandparents came, my cousin Susann, my brothers and sisters were there. There was BBQ, and home made ice cream.......we had sparklers. I thought it was almost as good as Christmas........didn't really understand the significance of the holiday, but I knew there was something special about it. I think it is important to remember birthdays......yours, and your country's. It is not just another day......it's the day you were born.....the day your country was born. Happy Birthday America! May we always celebrate, may we always remember how special this day is. I knew the moment I saw him, he had been in the military.......I have spent way too much time teaching yoga to those who serve, there truly is a difference. Pieter and his wife Vicki walked into the infusion room several months ago, actually back in the fall. It was one of those days that Rick had taken a box of his books with us to give to the other patients. would beat the cancer. Every time we did treatments together, he was so brave, so courageous, so full of spirit. He had fought in Viet Nam, and like so many had been exposed to Agent Orange..........did we have a clue what exposure to that chemical would do to so many? We sat and talked, he was proud of the work that I was doing with those in the military who had addiction issues........he encouraged me to give all that I could. in the room felt hope in their hearts. In April, Vicki e-mailed me.......the cancer was back with a vengeance, it had appeared in his brain......not much hope. Of all things, he was worried about me........I assured them I was fine, he had to be too. This morning came the news, Pieter fought his last battle. Some may think that the cancer won......but I choose to think, somewhere, someplace........Pieter is leading his troops again.....young, healthy and whole.